Understanding the effects of in situ fluid content and fracture parameters on seismic characteristics is important for the subsurface exploration and production of fractured porous rocks. The ratio of normal-to-shear fracture compliance is typically utilized as a fluid indicator to evaluate anisotropy and identify fluids filling the fractures, but it represents an underdetermined problem because this fluid indicator varies as a function of both fracture geometry and fluid content. On the bases of anisotropic Gassmann’s equation and linear-slip model, we suggest an anisotropic poroelasticity model for fractured porous reservoirs. By combining a perturbed stiffness matrix and asymptotic ray theory, we then construct a direct relationship between the PP-wave reflection coefficients and characteristic parameters of fluids (P- and S-wave moduli) and fractures (fracture quasi-weaknesses), thereby decoupling the effects of fluid and fracture properties on seismic reflection characterization. By incorporating fracture quasi-weakness parameters, we propose a novel parameterization method for elastic impedance variation with offset and azimuth (EIVOA). By incorporating wide-azimuth observable seismic reflection data with regularization constraints, we utilize Bayesian seismic inversion to estimate the fluid content and fracture parameters of fractured porous rocks. 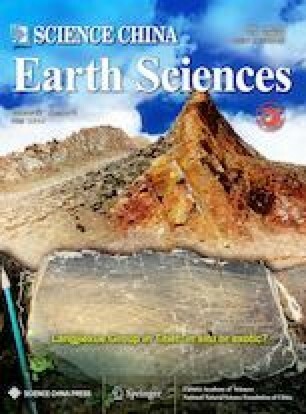 Tests on synthetic and real data demonstrate that fluid and fracture properties can be reasonably estimated directly from azimuthal seismic data and the proposed approach provides a reliable method for fluid identification and fracture characterization in a gas-saturated fractured porous reservoir. The work was supported by the National Natural Science Foundation of China (Grant No. 41674130), the National Science and Technology Major Project (Grant No. 2016ZX05002-005).